Mayor Joe Ganim, right, is joined by other officials such as State Senator Marilyn Moore and City Council President Tom McCarthy to help A+ Technology and Security President David Antar, center, cut ribbon. It’s not every day the city scores an A+. 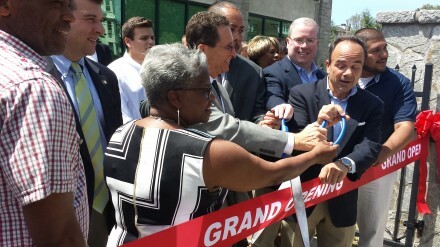 On Fairfield Avenue, a few blocks from the Klein Memorial Auditorium, Mayor Joe Ganim on Tuesday was joined by city and state officials for the grand opening of security provider A+ Technology and Security Solutions‘ expansion from Long Island to its first physical presence in Connecticut in a state-of-the art 7,000 square-foot New England headquarters. Jorge Garcia, who served as director of Public Facilities and Construction Management under Mayor Bill Finch, is director of the company’s New England Operations that provides video and security technology for public schools and security surveillance at Pleasure Beach. Garcia pointed out that Finch, a technology policy wonk, would be proud of the company’s investment in the city. Company officials say the expansion in Bridgeport allows its security, technology, solutions and services accessibility to the New England region while growing jobs in the city. The company has started with seven full-time employees from Bridgeport and plans to increase that number to over 20 in the coming year. The office is located at 1027 Fairfield Avenue on the West Side. “A+ Technology & Security Solutions’ New England Headquarters in Bridgeport comes on the heels of the company’s longstanding relationship with the City of Bridgeport as a security provider that resulted with it earning the 2014 Security Innovation Award–Municipal Sector,” says spokesperson Margie Gurwin. · Installing a Security Operations Center in Bridgeport last year. How young are you this year, Lennie? Celebrate the years behind you and the relationships engaged and stay excited with future prospects. Change is coming. Bumped into Jorge Garcia recently and he was expressive about his current work. The work was done without abatement or bonding as part of economic development. Of course the business is an employer and taxpayer as well as a vendor to the City. Isn’t this another reason to celebrate? Time will tell. While I hope Bridgeport residents would have first consideration for these jobs, if no state or municipal funding was involved they really have no obligation to do so other than their own commitment to the city. Their only client is the city of Bridgeport!!! Joe looks a little worried in the photo. Who wouldn’t be? There is a very large, sharp object and Chris Rosario and Tom McCarthy are standing behind Joe where he can’t tell what they are doing. Does anyone else think maybe Bridgeport needs a revolving door ethics policy? Cutting ribbons in Bridgeport is impressive but if your goal is to enter the New England market, no place is better than Boston Mass USA. http://www.BostonMassUSA.com < — This is where I put A+ Technology and Security's link because my Bridgeport economic development program is lightning fast when responding to current needs. While there might be legitimate questions about certain aspects of the city’s relationship with this business, it is a very good fit for Bridgeport and represents a foot into the 21st Century for Bridgeport’s business community. And it’s an addition to the grand list and potential employer/trainer for good jobs for Bridgeporters. Another positive is the potential synergistic relationship this business could develop with UB and its computer engineering program, which is at the forefront of security software and hardware research and development. I am glad this firm came to Bridgeport. However, having Mayor Ganim come to and tout the opening of a firm with seven employees shows how desperate he is. Mayor Finch did not come to CAI when we opened in Bridgeport with a similar number of employees with a national mission and national impact!